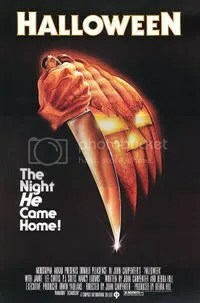 For the end of the Halloween season, I’ve been trying to watch horror movies that I have never seen or haven’t seen in a while. Funeral Home falls under the “never seen” category, and boy, I wish it stayed that way! 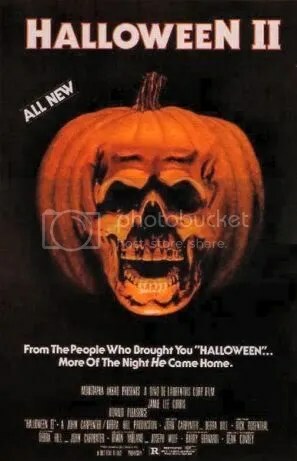 A Canadian production filmed in 1979 and released in that country by Frontier Amusements in 1980 as Cries In the Night, the movie would be re-titled Funeral Home for its 1982 U.S. theatrical and future home video releases. Given the independent distributors and the very low-budget nature of the movie, I imagine this movie probably never made it to a cineplex, but instead could probably have been found as a double feature at a rundown drive-in somewhere. The best thing this movie has going for it are the movie posters. The U.S. version makes it look like good cheesy ’80s horror fun, while the black & white Canadian poster makes me think it might be something a bit more shocking. Too bad it’s neither. Funeral Home‘s trailer does a pretty good job of making the movie seem creepy, but the actual film moves at a snail’s pace and you don’t even seen anyone killed until 32 minutes into the movie. [SPOILER]And even that is just people drowning in a car. [/SPOILER] The movie features very little gore and mostly relies on darkness and the score to help set the mood. In short, Funeral Home comes across as a late night made-for-TV movie and would be ripe to RiffTrax to pick at. I will say that the ending is kind of interesting, even if somewhat of a cop out. Check the movie out for yourself… if you dare. Until about two months ago, I’m not sure if I had ever heard of the late ’80s slasher horror movie Blood Rage. I know for a fact that I had never seen it. I thought I knew of pretty much every ’80s slasher movie by this point even if I hadn’t seen them all. If I came across it on my own while browsing Amazon Video (where it is free to stream for Amazon Prime members as of this writing) I am not sure if I would have pressed ‘play’. However, I did watch a video review of it from Eric over at his MountainTop9 YouTube channel and thought it sounded interesting. During their childhoods, Todd is institutionalized for a murder whilst his twin goes free. 10 years later, on Thanksgiving, Todd escapes and a killing spree begins in his neighborhood. There’s good reasons why this film went under my radar and is a fairly obscure slasher movie– it’s quirky and weird. Some of the scenes and actors are just odd. Whether intentional or because of a mish-mash of poor dialogue, editing, and acting, some scenes come across as fairly awkward. But, given the low budget nature of this trashy slasher, all of that kind of comes with the territory. This movie does have three things going for it: a fantastic little synth score, lead actor Mark Soper, and some wonderful special effects when it comes to the gore. Firstly, the synth score by Richard Einhorn is a true standout from ’80s horror. Einhorn is still active to this day (mostly composing for documentaries) but worked in the ’80s on more horror movies such as The Prowler, Don’t Go in the House, Eyes of a Stranger, and two episode of the Tales from the Darkside television series. It’s amazing this didn’t lead to higher profile work for Richard Einhorn but now it makes me want to check out his other works to hear what else he has done. Mark Soper is easily the best actor in the entire movie. He pulls double duty here as twins Todd and Terry Simmons. Todd and Teddy are two totally different characters and Soper seems to have no problem portraying the swaggering, cunning & psychotic Todd and just as effortlessly assumes the role of the naive, simple & shell-shocked Terry. Thirdly, while I’m certainly not a gore-hound, I have to give this movie kudos for the special effects in this movie. Special effects artist Ed French did a really good job here. He worked on tons of horror movies in the ’80s. For a movie that probably didn’t have much in the way of budget beyond a bag of Doritos Cool Ranch, the work put in here is most impressive. Blood Rage was remastered and released on Blu-ray awhile back by the UK-based Arrow Video and I’m sure that’s the print being using by Amazon Video because it looks very nice and clean. If you haven’t seen this movie, and you’re a fan of cheesy and trashy ’80s horror movies, this is one you should definitely check out. It isn’t amazing, but it’s an interesting and decent use of 87 minutes for people who are into this genre of horror. It’s here! It’s here! It’s finally here! October 1st! Halloween season has kicked into overdrive! Check back frequently for my stupid little posts about music, movies & junk food that I can tie into theme of Halloween! I remember there was a time when having the Universal Monsters just on DVD seemed like it was never going to happen. Now we’re well past DVD releases and we’ve had multiple Blu-ray releases over the last few years. 2017 brings us yet another release for the seven major Universal Monster movies, only this time they are exclusive to Best Buy. I have all of these movies on Blu-ray already, but the new black & white cover art painted by comic book writer/artist Alex Ross is excellent and I felt the artwork was worth posting. It would be cool if they could release the artwork as posters at some point. Side note: I generally don’t care for reissues that feature new artwork on the cover. I guess it’s a good way to get people who already own the movie, to buy the latest issue but the new artwork generally doesn’t compare to the original artwork used for the movie’s theatrical/video release. Another Romero zombie movie… Road of the Dead. I guess it was officially announced as happening around April/May, but George A. Romero is working on getting another zombie movie going. The screenplay has been written and it’s being shopped around in Montreal later this month at an international film festival where Romero will be seeking financing. Honestly, I’m not too excited for it. I was very excited for Land of the Dead (went to see it opening weekend at the movie theater), less excited for Diary of Dead, and then even less excited for Survival of the Dead. Those entries into Romero’s ‘Living Dead’ series range from disappointing to god-awful, so I’m not too sure if Romero really has anything left in the tank. Further giving me mixed feelings is the fact that Romero isn’t even directing. He’s a co-writer and co-producer, so it leaves me to wonder if we can really call this a Romero zombie movie since the film’s director Matt Birman also gets a co-writer/co-producer credit. Maybe this is actually a Birman zombie movie? To me, the film sounds like a mix of Mad Max and Death Race 2000, but it’s being described by Birman as a mix of Mad Max, Ben-Hur, Rollerball, and NASCAR. Uh… okay. That doesn’t help sell it. This sounds like it’s going to be really hokey cartoon horror. It’s Romero and it’s zombies, so I’ll give this movie a shot, but I’m expecting very little from it. What I would love to see is Romero direct one final entry into the series. Get back to the bleak & nihilistic vibes of Dawn of the Dead and Day of the Dead, but end the film on a hopeful note. I don’t think that will ever happen though. It’s midnight, which means Halloween has officially arrived! I have a few errands to run early in the morning, but after that my entire day is wiiiiiiiiiide open for binging on horror movies. I’ve already watched a number of classics this past month such as various offerings the Universal Monsters, the original Fright Night, and Trick Or Treat. I was hoping to get around to watching some classic horror from Hammer Studios along with a few Friday the 13th films, but it doesn’t look like I’ll make it in that regard. Obviously, there’s no way I can watch ALL of those movies, but I’m definitely in the mood for the 1990 Night of the Living Dead remake, Return of the Living Dead, and Halloween 1/2/4/5.